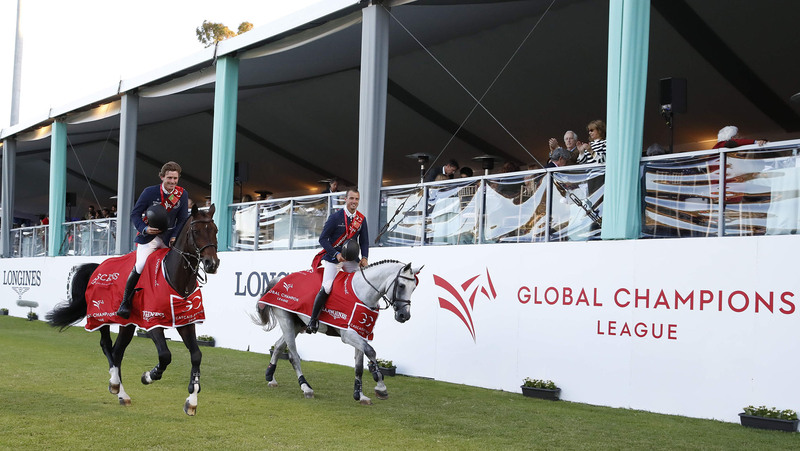 Paris Panthers’ duo of Gregory Wathelet and Darragh Kenny stormed to a sensational win in a thrilling GCL Cascais, Estoril showdown. As the Championship gallops to the midway point, the Panthers pulled out all the stops amidst challenging weather conditions to convert their R1 pole position into a win - one of only two teams to do so this season - moving up an impressive five places in the overall rankings. The battle for the top spot has tightened with teams looking to the GC Play Offs and GCL Super Cup, where only 16 teams will qualify to compete for an unprecedented 12 million euros in prize money. London Knights and Valkenswaard United look to be pulling away from the rest of the field, but there was movement up and down the rest of the field. Still in the lead on 174 points are the Knights, however United sit 7 points behind, now on a tally of 167 overall. Shanghai Swans keep hold of third, with 127 points overall, with Miami Celtics and Scandinavian Vikings now just one point apart following the podium finish for the Vikings today. With a full grandstand, clear blue skies and the shadows lengthening across the picturesque grass arena, the late afternoon competition saw top sport featuring thrills and spills, with unexpected results having a massive impact in the final standings. Course designer Frank Rothenberger produced an impressive 1.55m track, once again allowing long galloping distances and utilising the full length and breadth of the arena. A scopey GC black and white oxer set as the riders passed the in-gate caught out a few, a double of oxers needed plenty of power and a gappy triple combination across the diagonal required scope, balance and pin point precision with strides. One of the highest scoring teams during R1, the Shanghai Swans had everything to do, but there was redemption for Pius Schwizer with Chidame Z after they delivered a flawless round. He was swiftly backed up by Daniel Deusser and Tobago, the duo fast becoming one of the most valuable players in the Championship as they pulled out yet another double clear this weekend to keep their team on a score of 16. A refusal for Prague Lions’ Gerco Schroder and Glock's Lausejunge at the GC double, plus the final rail and a time fault meant the Lions plummeted down the order, despite a brilliant clear from teammate Ales Opartny with VDL Fakir. There was further heartbreak for home city team Cascais Charms after four faults in the triple combination from Philip Houston with Chalanda and another four from Luiz Felipe De Azevedo Filho with Chacito kept them down at the bottom of the pack. It was a day to forget for Monaco Aces, after Simon Delestre collected an uncharacteristic 22 faults with Sultan de Beaufour. Another four from teammate Julien Epaillard and Virtuose Champeix meant the team would tumble down the order. Similarly, David Will of New York Empire picked up 16 faults with Forest Gump, with teammate Scott Brash and the nine year old Hello Shelby rolling a further two poles. The pressure was on for Valkenswaard United, who sat a pole away from rivals London Knights after the first round, the team keen for a strong result to close the gap in the Championship. Another four faults for Alberto Zorzi and Contanga meant everything rested on anchor Marcus Ehning, but the German maestro delivered another phenomenal clear with Funky Fred to keep United in reaching distance for a good points haul. First of the double clears, Montreal Diamonds were hoping for a clean scoresheet but the first part of the double of oxers came down for Mark McAuley with Miebello. Danielle Goldstein and Lizziemary also collected four faults, dropping them down to a score of eight and behind Valkenswaard United. Rome Gladiators made a strategic change with Lorenzo de Luca stepping off the bench in place of Marlon Zanotelli. Riding the fiery stallion Halifax van het Kluizebos, de Luca powered around the arena, managing the hot horse brilliantly and flying to the final fence on five strides to keep the team on a clean score. But it started to fall apart after Abdel Saïd and Jumpy van de Hermitage collected eight faults, dropping the team below Valkenswaard United. Ranking leaders London Knights kept their GCL R1 line up exactly the same, with Nicola Philippaerts and H&M Harley vd Bisschop and Martin Fuchs with Chaplin taking centre stage. First to go Nicola Philippaerts piloted the dapple grey stallion around the arena, the powerful horse unfazed by the arena. They looked good for a clear until they clipped the final oxer, the pole rolling and adding 4 faults to the team score. An early pole for Fuchs meant the duo had to pick up the pace, to try beat United’s time for a podium position. The young Swiss star delivered, with the team on a combined time 6 seconds faster than United. A clear from Christian Ahlmann and Clintrexo Z of Scandinavian Vikings kept the team in with a chance for a win. Leopold van Asten and VDL Groep Beauty flew around the arena, but a pole down meant they would stay on four, with only a clear or faster four from the final team robbing them of the win. Final team to go, the Paris Panthers, were hungry for the win that had so far eluded them this season. Darragh Kenny picked up the reins first, guiding Balou du Reventon masterfully around the arena to give teammate Gregory Wathelet the best possible chance of a team win. An early pole for Wathelet and his grey stallion Mjt Nevados S turned up the heat, as the experienced rider put pedal to the metal to deliver a speedier time. It would be just enough, the combined score two seconds quicker than the Vikings, meaning that the Panthers would take their first win of the season and a huge points haul. The Championship now looks to round 9, and Monaco, as the fight for a place in the GC Play Offs intensifies. Jan Tops, Co-Founder GCL: “What makes an event is the people. We’ve had a great partnership since the beginning with Duarte, he’s a big supporter of the LGCT and GCL since the concept was started. The London Knights are very consistent and well planned. Everything is open, we’re only half way, so anything can happen. It’s going to be very exciting until the last moment - you can see that Paris Panthers have risen to the middle [of the rankings] so it’s very exciting. It’s amazing tension until the last rider. Next week we are off, and we have the [transfer] window for the team riders, before we head to Monaco." Nicola Philippaerts, London Knights, 3rd place: “We started very well. Today we were a little unlucky even though our horses jumped very good. We’re trying to be consistent at every show, and stay at the top at every event. The season is long, we’re in a good position now but anything could happen. The five of us have good horses too, and we can swap a bit so every time we go there’s a good horse from the start. It’s very important as every scores counts and we want to win it!" Darragh Kenny, Paris Panthers, 1st place: “It was a very good result for us - we were in a good position going into today, we had the same thing in Mexico and we ended up third, so it’s good to finish on top today. It was important for us to have a good result today [for the overall rankings] - Gregory was fantastic on the first day, he left us with a really good round and score. Today worked out well!" Gregory Wathelet, Paris Panthers, 1st place: “I knew what I had to do, but I wasn’t sure about the time. I had one down so I knew I had to push on for the time! For sure it’s been an amazing [weekend] for me, it couldn’t have been better [with two individual wins, a team win and 2nd in the LGCT Grand Prix of Cascais]."